When I went to Florida to run the Goofy at the Walt Disney World Marathon, I decided I would go visit family in Fort Lauderdale before trekking up to Orlando to run. 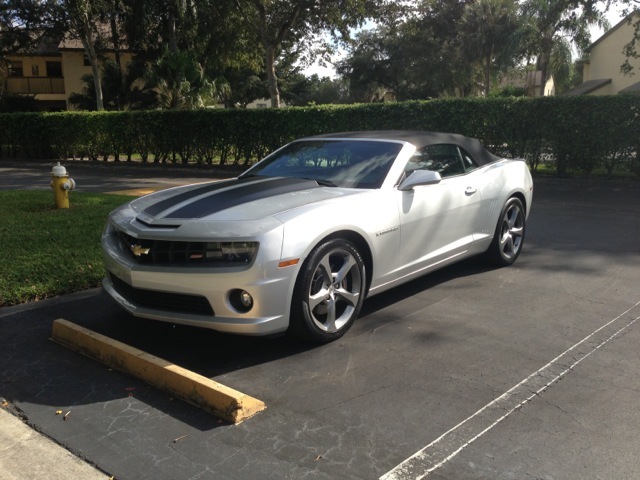 Since the two cities are approximately three hours apart, I reached out to my friends at Chevrolet about borrowing a car while I was down there and they lent me a 2013 Camaro SS convertible. As I was leaving my family and heading towards the highway, I stopped at a red light. A woman pulled up next to me and started waving her arms to get my attention. When I looked over, she mouthed to me between the two plates of glass that she loved my car. I smiled and gave her the thumbs up before taking off with the light. It was nice to see what a reaction it was getting as I was hitting the road. Florida is a flat state and the highways don’t have much curve to them, so I was able to open up and feel the power of the 426 horsepower engine. Easy acceleration and tight handling were put to use as I made my way through traffic on Interstate 95 and Florida’s Highway. A comfortable, smooth ride from my family to Walt Disney World that passed faster than I would have thought, and felt faster than my previous drives up through the Sunshine State. The Camaro was equipped with the latest in Chevy technology, including the MyLink and OnStar. MyLink was great for listening to my iPhone, SiriusXM Satellite Radio, talking using the car’s bluetooth, and using the built-in GPS navigation system for finding my destinations all week, but the MyLink was a bit complex to figure out initially. Since I only had the car for a week and was more interested in getting to my destinations than taking the time to read the manual, I had trouble at times getting it to do what what I wanted initially. Of course, once I was at Walt Disney World, I needed to visit the Test Track in EPCOT, which was sponsored by Chevrolet. Configuring concept cars, then “testing them out” on a track that swerves indoors then pushes you 60-70mph outdoors was a fun ride, followed by different areas in the pavilion to create your own car, test the car you “test drove” in other areas, and a showroom to see the latest cars available from Chevy. There were even a few green screen picture stations, and the only one with a line was to take a picture with a yellow Camaro. Unfortunately, all good things must come to an end, and I had to return to New York. I returned the car with some hesitation, but an airplane was waiting for me and the silver convertible had to go back to its rightful owners. The Chevrolet Camaro was fun to drive, especially on those flat, open highways on a Thursday afternoon, and I hope to drive one again some time.